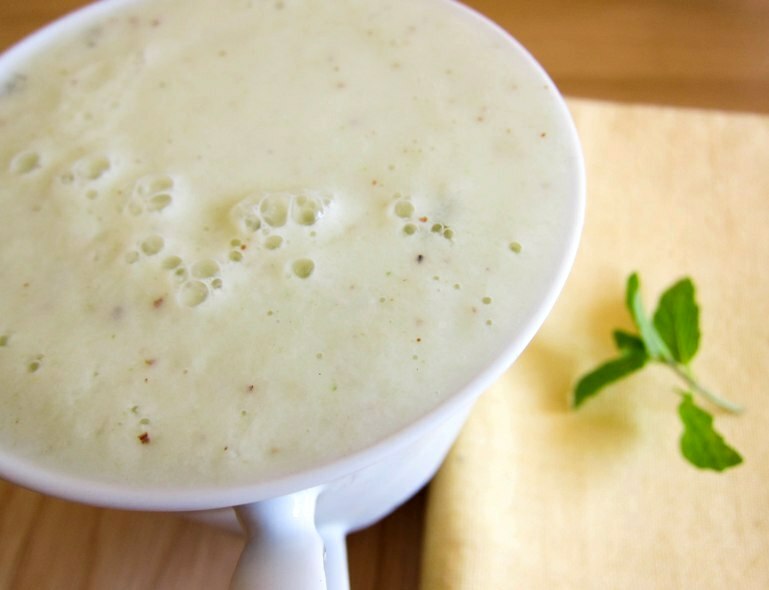 lettuce pear salad smoothie: green, but not too green. Green smoothies. The concept just doesn't sit completely comfortably with me. It conjures up the traumatic days of my childhood, the days when my parents were in the fervent throes of the wheatgrass fad. They grew their own wheatgrass with diligence, harvested them with enthusiasm and every so often I will have a cup of freshly blended wheatgrass juice cheerily slotted into my hands. Bless them, my parents want only the best for my health. But that thin swampy-looking liquid that smelt and tasted like freshly mowed lawn... well, it just had zero appeal for me. But I had an idea the other day, where I thought perhaps - just perhaps - I could introduce a little bit of green in my smoothies. Not dark green. Not even medium green. But just a little pale green - we are, after all, talking baby steps here - in the form of lettuce. I thought that could be alright. And I'm glad to report that it was... better than alright, actually. So it's not super green, but I've added vegetables to my smoothie - and enjoyed it! A small but worthy achievement, that. So imagine a light and healthy salad with fresh pears and lettuce, strewn through with mint leaves and toasted almonds, then drizzled with an orange, yoghurt and honey dressing. Then slightly shift your paradigm, and imagine that again, but in smoothie form. Are you feelin' it? Oh yeah, I'm feelin' it. light and refreshing, fruity and nutty and just a little bit lettucey. That is amazing! You may have hit on something here. Thanks Foodycat! I was happy that the idea translated quite nicely in reality, as it's not always the case! This looks delicious! I could definitely go for one for breakfast, and I love your combo of flavors - very interesting and I bet very yummy! Unlike Agnes, I refuse to poke fun, because I love spinach in my smoothies. I'm also utterly delighted with this recipe as my green smoothie making has faltered with the exponential increase in banana prices. I have pears, though. Hurrah! Hurrah, Hannah! Banana prices are indeed crazy these days. But I'm happily devouring cheap pears and persimmons. I like to add fruits and other vegetables in green smoothie. Then a fruity freshly mowed lawn. Your lettuce pear salad smoothie is a great idea. I was attracted to the photo and just love the macro photography. But, now I am intrigued by the smoothie. Another great blog from Australia! 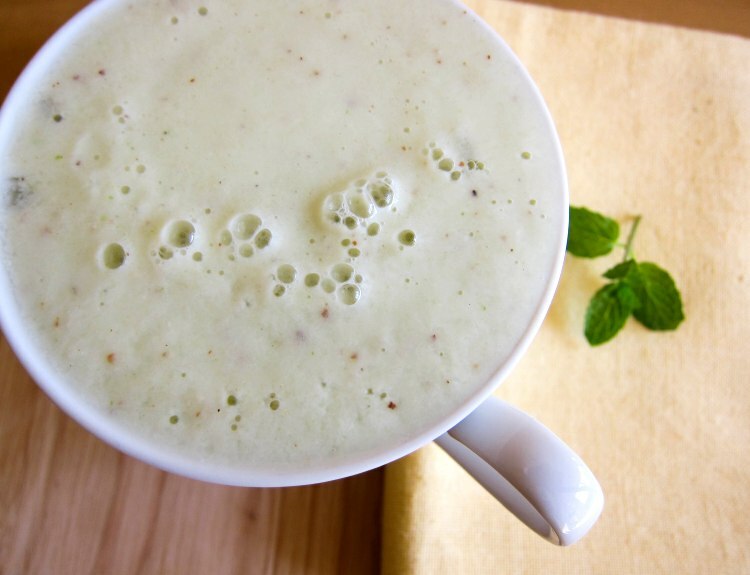 I adore green smoothies! I'll have to try this one soon! A very interesting combination of ingredients. I don't think I have ever tasted pears with mint in the same dish: I must try. haha, freshly mowed lawn - yeah, not appealing. I need to get more into green smoothies. I've only had one (from a cafe), and it was amazing - lots of avocado and mango. Yours looks delightful! Haha msihua. It's nice honestly! Heidi - the green smoothie you had sounds great! I might try something similar next time I make another one.